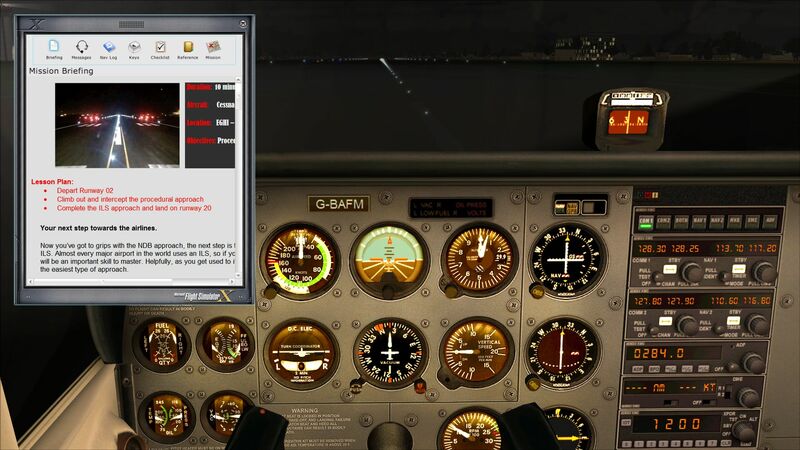 FSX Insider | Get Your Flight Training On With FS Academy! Developed by a real commercial pilot, FS Academy – On Instruments combines video tuition, flight briefings, approach charts and FSX missions into a full training package for the sim pilot that wants to take their experience to the next level. Learn how to use approach charts and fly complex instrument procedures including holding patterns, ILS approaches, and DME Arcs. Put your knowledge into practice with 8 full FSX: Steam Edition missions which accompany the video series, testing your abilities and getting you to fly like a professional. Beginning with basic instrument flying and progressing to a full flight from A-B, you will be guided the whole way with comprehensive pre-flight briefings, custom made charts and audio commentary. You will learn the techniques that real commercial pilots use to get you home on those dark and misty nights! Don’t get grounded on rainy days! Learn how to navigate between Navigation Aids such as NDBs, VORs and DME ground stations to move from the world of visual flying and join the professionals. Instrument flying is the foundation of commercial flying. A requirement for all airline pilots, it’s time to learn how to fly on instruments like the pros with FS Academy – On Instruments. Can’t find the videos? Read this.